For the CSS Acadia: 100 Years special exhibit, the museum held a photo contest for the public to enter via Facebook, Twitter and Instagram and even in person! We had close to 100 entries and thank all who participated. Our winner Scott is a photographer from the Annapolis Valley in Nova Scotia and started this passion in 2005. 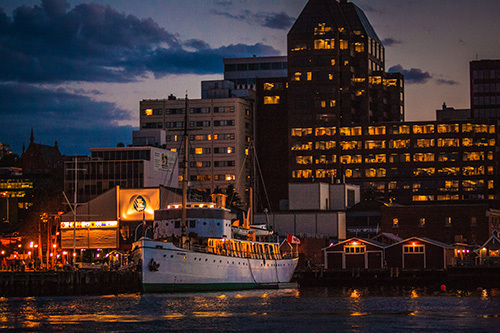 The Halifax waterfront has always been a favorite photographic location for him and his wife as they both love the water and in 2008, they were married on the Tall Ship Silva, which docks on the Halifax waterfront during the summer season. This past summer, they were on the ship again, and that’s when he took the photo. “When we set sail it was starting to get dark out, but there was still enough light to take a few shots of the water front as we pulled out of the dock. The image of the Acadia was one of those shots. I felt it had a special quality compared to some of the other photos that I had taken that night,” said Scott.